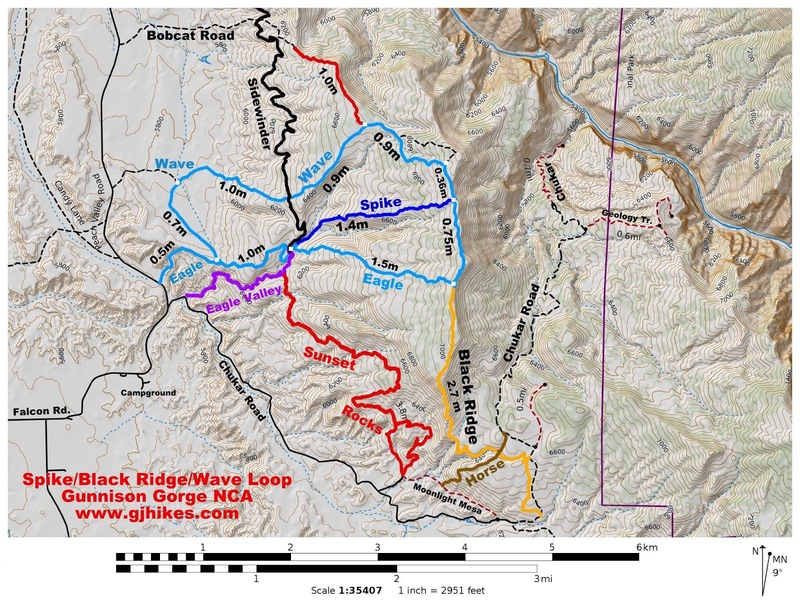 The Black Ridge trail is located in the Gunnison Gorge National Conservation and Wilderness Area near Delta, Colorado. At 2.7 miles in length it serves as part of the longer Red Rocks/Nighthorse trail. Together the various components are also referred to as the 'Rim Trails'. The Black Ridge trail begins at the upper end of the Eagle Road where it follows the rim heading south before making a dramatic descent down Black Ridge and coming to an end at the Chukar Road. There are 2 connecting trails that offer an early escape to the Chukar Road. It is also crossed by the Horse Trail and an unnamed jeep road. This post begins at the upper end of the Eagle Road. The map at the end of the post shows the various trails in the area that can be followed to get to this point. At the time these photos were taken the trail marker at this end of the trail was broken off. Before getting underway you might want to take in the elevated views from the ridge. Directly below the ridge you can see the Chukar Road which leads to the put in spot on the Gunnison River for rafters. It is the first put in this side of the Black Canyon of the Gunnison National Park. A good part of the trail along the ridge runs like a racetrack. There are a few rocky areas that for the most part are easy to travel over. That all changes when the trail reaches the end of the ridge and begins its descent. The first ledge has a 3-4 foot drop. The options are to either jump off of it or pass through 1 of 2 slots. After that the trail works its way around the rocks and boulders that decorate the ridge. Besides the views of the surrounding landscape from this elevated position the ridge itself is very scenic. Near the 1 mile point there is a short connector that comes up on the left that provides an early escape to the Chukar Road that is about a half mile away. The upper part of the connector is very steep with a good bit of loose rocks. The trail continues its moderately steep descent down a mixed bag of rough rocks, loose rocks and well packed trail. At one point the trail comes to some slickrock where there is a wash on the left and a spillover on the right. 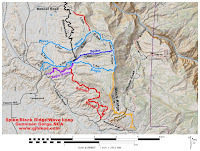 The wash is actually a short spur trail that runs over to the previous connector providing a much easier route to the Chukar Road. Near the 2 mile point the trail levels off as it passes by a cool looking spillover. On the other side of the spillover the Black Ridge trail is crossed by the Horse trail. A good hiking route is to park off of the Chukar Road at the point where the Black Ridge Connector and the Horse trail begin and make a loop out of them that will take you right by this exact spot. The trail gets a lot funner as it makes a run down a shallow wash. Within a quarter mile it comes out of the wash and crosses an unnamed jeep road. After the unnamed road the Black Ridge trail continues working its way down the drainage. Towards the end it leaves it behind and makes a traverse around the hill until it drops on down to the Chukar Road and comes to an end. There is a short connector on the other side of the Chukar Road that runs over to the staging area on this end of the Elephant Skin Road where the Red Rocks trail takes off on the left and the Slanty Bridge and Moon Light Mesa trails take off on the right. As far as the Black Ridge trail goes it was pretty tough in places on a mountain bike. We have hiked parts of it in the past and it was pretty good for that. There must be dirt bikers that like it because they keep coming back. If you would like to see it for yourself then all you have to do is 'Take a hike'.